I'm really not sure where to begin with this topic. I have touched on it in past posts here and the end of the post here. The reason I don't know where to start is that this topic is so HUGE and most people know so little about it. Here is a small amount of information that I will build on in future posts. •Thousands of TONS of plastic exists in our oceans. •Only about 5% of the plastic produced annually is recycled. 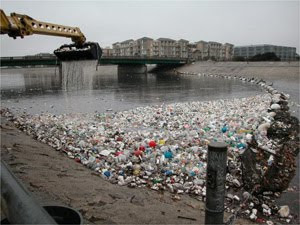 •Plastic, because it floats, makes its way to the ocean through a variety of waterways. •The plastic is carried from the waterways to the oceans and swept up by the currents where it remains and slowly ends up in one of the gyres. The most studied of these gyres is the North Pacific Gyre, but there are actually 5 gyres. •A gyre is a massive, slow moving oceanic whirlpool in which plastic trash can accumulate and remain for many, many years until it breaks down into ever smaller particles. •Marine life mistake this trash for food. Turtles, whales, fish, etc. are eating the shopping bags, bottle caps, and small particles instead of proper nutrients from the ocean. •Birds, such as the albatross chicks (see photo below) on Midway Island ingest the plastic until their stomach is so full that they die. 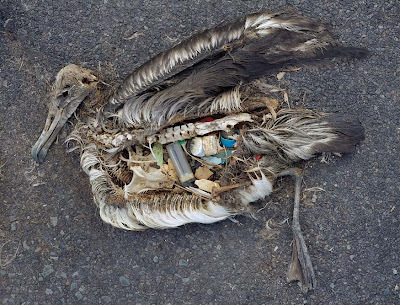 Their body then decays and the plastic in their stomach floats back into the ocean only to be consumed by yet another bird! Ugh. The best site to explain all of this is 5 Gyres. It is simple and easy to navigate. 5 Gyres is part of the Algalita Foundation. Algalita is tirelessly studying the gyres and the plastic contained in them. They are also educating the public about plastic usage and proper disposal. This blog is documenting their current trip to the North Pacific Gyre. The waste in this gyre is commonly referred to as a "garbage patch" and is about twice the size of Texas. What can you do? I ask myself this all the time. First, buy and use less plastic. Don't EVER buy bottled water. Ever. Drink soda out of glass or aluminum. Both of these materials are infinitely recyclable. At the supermarket, if you have a choice between a product packaged in plastic or in metal or glass. Choose metal or glass and recycle it. Vote with your wallet. If we all stop buying so much plastic, companies will stop producing the large quantities that eventually end up in our waterways, oceans, and marine life. It really is a huge problem. Thanks for sharing! yes. yes. yes. As you know this is a subject near and dear to my hear too. I pledge to NEVER buy plastic water bottles, avoid plastics as much as I possibly can, and to ALWAYS shop with a fabric bag (Green Bay Lady bags are my favorite!). I wonder if we should start calling companies that sell things in plastic containers and telling them we won't buy them until they switch to glass? We could target our favorites... I bet if they got enough people boycotting them we could at least get the issue on their radar... .hummmmm. It is a terrible thing ... especially the birds. Never in my life have I heard about that. Clean our land begins with the education of each of us. We teach and train a child with malechku worry about our planet. A state according give this note to a greater extent. Yes Dasha, it is terrible! We have all got to pitch in and do what we can to stop this!